Born Terence Michael Joseph Butler on the 17th July 1949, in Aston, Birmingham, England, into an Irish-Catholic family, Geezer is a musician, lyricist and bass guitarist best known to the world as a member of the renowned heavy metal band Black Sabbath. Have you ever wondered how rich Geezer Butler is, as of early 2017? According to authoritative sources, it has been estimated that Butler’s net worth is as high as $70 million, an amount earned through his successful career in the music industry which started in 1967. Geezer has also had success on his own, releasing three studio albums under the name GZR, the sales of which also improved his wealth. He got his nickname in school; as he called everybody “Geezer”, the nickname stuck with him through entire life. 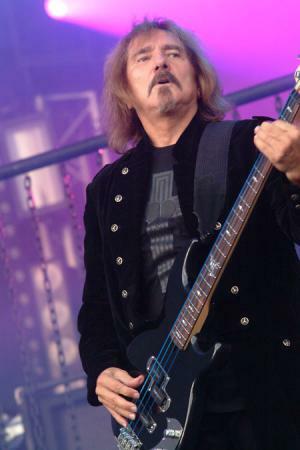 Geezer came in touch with professional music in 1967 when he formed the band Rare Breed, with Ozzy Osbourne on vocals. During that time, Geezer was dating a girl who lived close to Tony Iommi, and the two got acquainted when Tony’s and Geezer’s band played together at a local nightclub. Geezer and Osbourne broke up their collaboration, but then reunited by way of Polka Tulk, joining with Tony Iommi and Bill Ward. Soon they changed their name to Earth, but found out that there was already a band of the same name, and so changed it again to Black Sabbath. Geezer oversaw the release of 14 albums, including “Paranoid” (1970), which topped the UK Albums Chart, and achieved four times platinum status in the US, “Master of Reality” (1971), which achieved double platinum status in the US, “Heaven and Hell” (1980), on which Ronnie James Dio served as the vocalist, “Born Again” (1983), which certified platinum in the UK, and their last studio release “13” (2013), which topped the charts in several countries, including UK, Austria, US and Germany. Apart from Black Sabbath, Geezer has worked with Ozzy Osbourne on Ozzy’s solo albums, “Just Say Ozzy” (1990), “Live & Loud” (1993), and “Ozzmosis” (1995), while he also worked with Iommi, Dio and Vinny Appice in the band Heaven & Hell, releasing three albums – “Live from Radio City Music Hall” (2007), “The Devil You Know” (2009), “Neon Nights: 30 Years of Heaven & Hell” (2010), which has also improved his wealth. Regarding his personal life, Geezer is married to Gloria Butler, and the couple has two sons. Geezer is a big supporter of the Aston Villa soccer club. Furthermore, Geezer is a vegan and has protested against Fortnum and Mason, while also urging fans to support him. Most recently he spent a night in jail after being involved in a bar brawl; he was charged with misdemeanor assault, vandalism and public intoxication. 1 [on the issue of a new 'Black Sabbath' recording, 2013] It's like the old saying - you do what you know best. You sort of forget all the keyboard bits and all the multi-instruments and just get back to the basics, like on the first three or four albums, and just keep that live feel. We had the sort of philosophy that if it wasn't done in four takes, then forget it. 1 The song Sweet Leaf got its name from a brand of cigarettes that he bought in Dublin, Ireland. 3 Played on all of the classic Black Sabbath albums, 1970-1983. 4 Was Black Sabbath's main lyricist throughout the 1970s. 5 Got nicknamed "Geezer" (a British slang term for "guy" or "dude"), because of his own habit of referring to everybody as a "geezer" at the time. 6 Is a fan of Doctor Who (1963), and makes references to this TV show in some songs found on his second solo album. 7 Originally played guitar but, when Black Sabbath formed, they needed a bass player, so he switched to bass. 8 He occasionally played bass for former Black Sabbath bandmate, Ozzy Osbourne, during Ozzy's solo career; appears on the live album, "Just Say Ozzy" (1990), and on Ozzy's 1995 album, "Ozzmosis". 9 Left Black Sabbath in 1984, saying in interviews that he was "sick of it all". However, he officially returned to the group in 1991. He recorded two more albums with Black Sabbath (1992's "Dehumanizer" and 1994's "Cross Purposes") before leaving again in 1994. Soon afterwards, he formed his own band called "G/Z/R". 10 Bassist for the legendary heavy metal band, Black Sabbath. 11 Is often credited as Black Sabbath's principal songwriter. Heaven and Hell: Live from Radio City Music Hall 2007 Video writer: "E5150", "After All The Dead", "The Mob Rules", "Children of the Sea", "Lady Evil", "I", "The Sign of the Southern Cross", "Voodoo", "Computer God", "Falling Off the Edge of the World", "Die Young", "Heaven and Hell", "Lonely is the Word", "Neon Knights"
Rock Band 2007 Video Game lyrics: "Paranoid" / music: "Paranoid" / writer: "Paranoid"
School of Rock 2003 as Terence Butler, "Iron Man"
Party at the Palace: The Queen's Concerts, Buckingham Palace 2002 TV Movie documentary writer: "Paranoid"